These two pocket-sized AM/FM/SW portables are clearly aimed at the person on the go…hikers…bikers and others who want the tiniest digital radio available that coves Shortwave as well as standard AM & FM broadcast bands. You could also stash one in a briefcase or desk drawer for emergencies. As such they do what they promise in a minimalist fashion. Both use DSP chip technology to improve the performance to cost ratio yet the two radios have a very different feel. Both run on two AAA batteries, feature a headphone jack, provide FM stereo at the jack, have clock, alarm and sleep functions and cover the standard AM band (520 – 1710 KHz), FM band (87 – 108 MHz). What’s Different Between The Two? The Radio Shack unit is a bit larger as you can see in the pictures, measuring approximately 4 3/4″ x 2 3/4″ x 5/8″. The Eton is supplied with a carry case, the Radio Shack is not. The Eton has a 3 volt DC input jack, the Radi Shack does not. (This doesn’t seem like a big point…it seems unlikely someone will power a tiny radio like these from AC power as it negates the portability these are primarily designed for). The Radio Shack’s memories are lost when batteries are replaced although one modder has already described online how a simple capacitor can be soldered in across the battery terminals to prevent this. With Power Off, the Hour Key cycles through the backlight brightness settings and you can lock the backlight on. Unlike the Eton Satellit, you can only do this with the Power Off because this is a dual function button…when the power is on that button adjusts the hour setting. With Power Off the Minutes button toggles between 9/10 KHz AM tuning steps. With Power On, in Shortwave the Time button will cycle through the SW bands. In ALL bands the Min and Hour buttons tune up or down on short presses and will auto seek with long presses. You can also tune in small increments with the Tuning thumbwheel on the side. Eton really should outline these multi-functions in the manual…without them tuning would be extremely slow using just the thumbwheel. But Eton is a bit behind the time with some of their manuals which still recommend Passport To World Band Radio as a resource…that publication has been out of print for many years! The Radio Shack uses variable speed Up/Down slewing buttons which take some getting used to. As you press one of the buttons, tuning starts out slowly, but suddenly jumps to fast…so fast that it often jumps way beyond where you want to be. Then you must tune in the opposite direction which can also overshoot your target frequency. It takes patience to learn the timing of this, and although it can be done, it is a bit tedious and you definitely have to learn the feel of it. 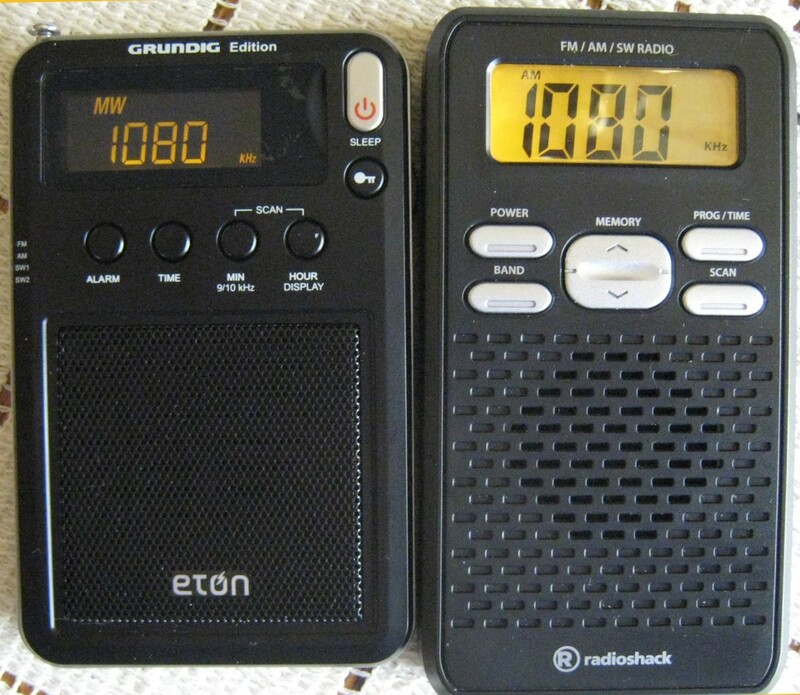 There are no huge differences in reception between these two radios. 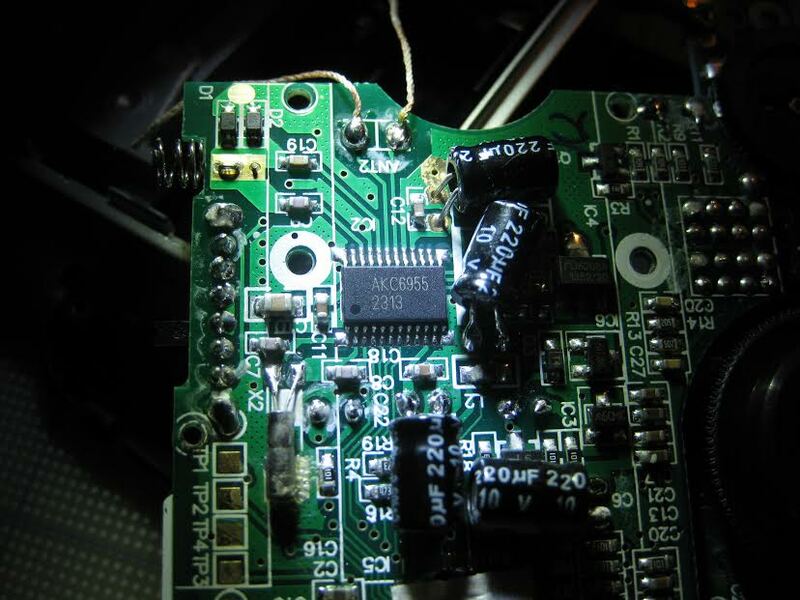 The reception is very good on FM which is becoming common on today’s DSP chip-based radios. On both AM and SW reception is considerably weaker…strong locals come in just fine, medium strength out of town signals are listenable although at reduced volume and weaker signals are just not there. Clearly these radios are not designed for weak signal DX…they are for convenient reception of typical local and semi-local stations. The radio Shack radio did exhibit mild digital whines in the background on some AM signals…there was none of this on the Eton. I also found that the Radio Shack was more sensitive at the bottom of the AM band, the Eton was better at the top of the AM band. This could vary from sample to sample however. SW and FM were quite similar on the two. Sound was very different though. On speaker The Eton was decidedly crisper and cleaner but a bit thin, while the Radio Shack sounded a bit fuller yet not quite as clean. These are probably quibbles in this class of radio…each sounded OK for its size and price. I would not rate one as better than the other…they are quite different but equal. However, when I compared them on earbuds, there was no comparison. ..the Eton sounder far better. It had a real sense of bass and treble whereas the RadioShack was very limited in its frequency response, sounding like all midrange by comparison. The effect was pronounced on both AM and FM…the Eton was much nicer sounding. Since neither of these radios comes with its own earbuds I used some which I am familiar with, using the same ones on each radio. Bottom Line: I think the average person who wants the tiniest digitally-tuned AM/FM/SW radio available has to accept some inevitable compromises in performance and user friendliness, and as such could be happy with either of these radios. But there are some differences which could help you decide which would most suit your needs. The Mini is a bit slimmer and shorter so if size is the single most important criterion for you, that could be your best bet. And if you plan to use earbuds I’d recommend the Eton as it sounds much better on earbuds. On the other hand the Radio Shack offers greater continuous SW coverage and that alone could tip the scales for some users. Click below to Eton Mini At Amazon.